Never Let A Late Start Get The Better Of You! I did realize one good thing during my walk today. In thinking, I realized that as I’m out there walking, I’m getting my Vitamin D! I’m not really much of an outdoor person, but this is a big bonus as far as I’m concerned. Love my morning walks! Regardless of the fact of my late start, I got out to pick up a few things at Aldi and also a stop at Family Dollar…one of my favorite spots. I needed a new sink stopper. Got it for $1!!! Ok, by Me! I also got some things done around the house that I’ll be happy about when I get back from our big trip. I got the curtains down and washed in both the kitchen and bathroom. I got the windows cleaned also and everything looks sparkly! This may not sound like much but when most of your house looks like a storage unit, small things give you pleasure and hope! After my walk I had a wonderful experience. 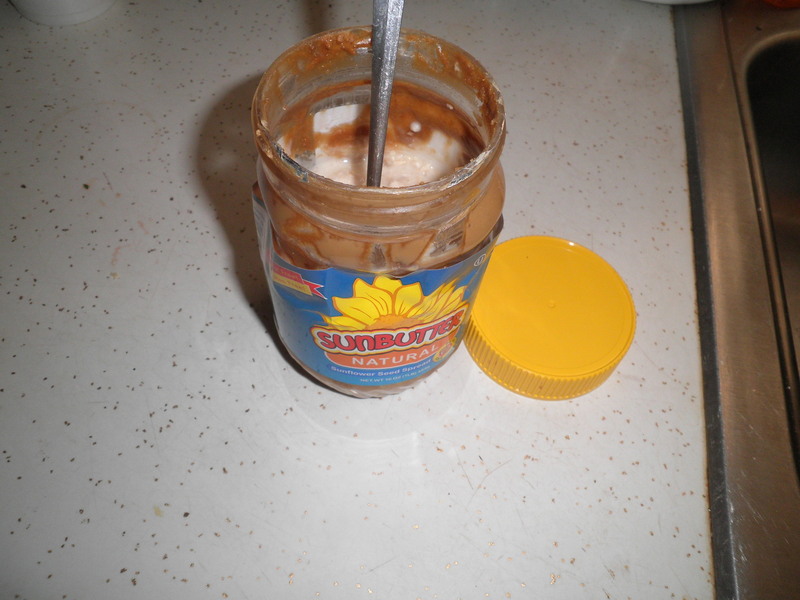 I had finished off a jar of Sunbutter and was saving the jar for overnight oats. Finally remembered on Sunday night to make some. The jar might look a bit misshapen. That’s because I like my overnight oats warmed in the microwave. I have to say that this was extremely tasty. I splurged the other day and made a stop at Target to pick up a replacement jar (actually 2!) I had a partial gift card to use. I wish this wasn’t so expensive because I’m hooked. Not eat it with a spoon hooked like I am with regular peanut butter or Biscoff, but spread it on caramel corn rice cakes hooked. I just Love it!! I also felt good about getting a lot of laundry done. I have got to get myself started sorting and packing for our trip. I’m still trying to unearth our suitcases!! Help! I need a Personal Assistant!! This entry was posted in Uncategorized and tagged exercise, nut butter, sorting and packing, Ultimate Blog Challenge, walking. Bookmark the permalink. your big trip is getting closer and closer…so exciting! yes – it sure makes a difference in traffic/noise when you get out a bit later! i enjoy the early morning quiet for running…as you say, even by 8 a.m. there is so much more going on! way to go on getting your windows all cleaned … it does make a difference to look out through spotless windows! i love different nut butters…have not tried sunbutter, but i’d be willing to! have a great day and thanks for posting at the “regular time” today, fran! If you pass a Trader Joe’s at any point in your travels, they have the best price on sunflower seed butter BY FAR. I need to make a trip there and pick up some of my own, yum! Like you say, not as insanely spoon-eating addictive as peanut butter, but still so good! I love coming home to a clean house, too–I washed all my sheets/bedding yesterday just so I’ll have a clean bed when I get back from house-sitting! Clean sheets…the best! I remember now that I had gotten sunflower butter at TJ’s. Guess I’m going to have to bite the bullet and drive up there after I get back from my trip. It’s worth it. There’s also a Whole Foods up there about a mile further. Hope you enjoy your house sitting!! Happy Tuesday, Fran! I love what you said about how nice it is to come back to a clean house after vacation. I’m so glad I did some work in mine before we left. Now all I have to do is tackle Mount Laundry! I can imagine all the laundry you have, Dana! So glad you’re back safely! Can’t wait to hear all about the trip! I was awake all night last night, ugh! Funny how your sleeping in messed you up. I did not love sunbutter when I tried it. I have no idea why since I like sunflower seeds so maybe I need to give it another chance. Biscoff I don’t dare buy. TJs also has cookie butter. It’s deadly. The one time I bought some it was gone in about 2 days. Scary! haha, sometimes I feel like I need a personal assistant too! And a maid, and then I realize I am the maid. Washing windows is no joke, definitely a huge accomplishment. Have a great day Fran! I keep seeing so many people post about sunbutter – I am going to have to try it. Dannii, I think it’s delicious. Tastes just like sunflower seeds, which I love. It’s kind of expensive though. Someone just told me you can get it at a better price at Trader Joe’s. I don’t have one nearby so I’ll have to plan a trip. I know what you mean about cleaning jobs like that; I finally descaled my shower cubicle last week and every time I get in it now, I admire it! yes, it’s pretty hot in the mornings! The gym had a power outage last thurs. so working out without ac was interesting! Corrie Anne…wouldn’t it be great if we all had an assistant? Actually, I think I’d be a good one, just can’t seem to do these things for myself! !